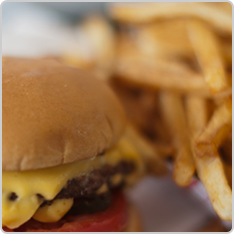 In 1949, Jay Adolph and Henriette Olsen opened the original PICK-QUICK Drive In, offering grilled burgers, fresh fries and creamy milkshakes to the Fife area. The hand scooped ice cream, fresh milkshakes and bottled soda pop made the burger stand an instant hit. Each day, 300 to 400 pounds of potatoes were hand cut to meet the demand for fresh fries. Today, one of PICK-QUICK’s current owners is Betty Burgi, who worked for the Olsen’s in 1952. She was often the only employee on shift, scooping the chilled ice cream and serving the hungry Fife crowds. In 1953, Andy and Victoria Boitano took over for the Olsen’s. The Boitano’s sold the restaurant to the Schorno and Marty families in 1958. After several years of the partnership, the Schorno’s took over the daily operation of the drive in. After 22 years and countless hours of serving up burgers, fries and milkshakes, the Schorno’s sold the business to Joe and Betty Burgi and Joe and Joyce Imhoff. In 1998, the Imhof’s sold their interest to the Burgi family. Today, Joe, Betty, their son Greg, along with son-in-law Dan and his wife, Cindi (Burgi) Nelson own and operate PICK-QUICK Drive In. Joe, Greg and Dan run the day-to-day business, while Joe and Betty’s grandchildren, Emily Nelson and Dominic and Hannah Burgi begin to prepare for the future of PICK-QUICK. Despite changes of ownership and partnerships, PICK-QUICK has remained in business for more than 60 years with a menu similar to the one that the Olsen’s originally established in 1949. Jay Adolph & Henriette Olsen opened PICK-QUICK Drive In. Andy and Victoria Boitano owned and operated the restaurant. In a new era of PICK-QUICK development, Paul & Ida Schorno and Ernie & Rosena Marty purchased the restaurant. Ernie & Rosina Marty moved back to Switzerland, Paul & Ida Schorno acquired sole ownership. Paul & Ida Schorno sold PICK-QUICK to Joe & Betty Burgi and Joe & Joyce Imhof. Joe & Joyce Imhof sell their share to Joe & Betty Burgi who continue to run and own PICK-QUICK today with the help of their family. Gerard Centioli from ICON partners with Burgi and Nelson family to expand PICK-QUICK to a new Auburn location. PICK-QUICK Drive In No. 2 opens in Auburn.